While her roles as a designer, analyst, project manager, and account services director at Street Level Studio all prepared her for leadership, there have been speed bumps along the way. There have been a few times I’ve second-guessed a decision, and it turned out that my gut reaction was the right choice! I do listen to the advice of my coworkers but learning to trust my own counsel has been one of the challenges of the job. When she initially came in as owner, her goal was to make the leadership transition as seamless as possible for the clients and the team. She recognized the wisdom of avoiding change for the sake of change. But, when the time was right, she confidently pursued her own ideas for growing the business. I realized there were risks worth taking to keep the company moving forward. I’ve learned to pay more attention to my instincts because, more often than not, it’s the right solution. If there’s any advice I could give, it would be to trust your gut! Her instincts were quite good. There were things we were already doing to fulfill clients’ needs, but the other part was continuing to explore new ideas, keeping our sense of curiosity, and staying on top of industry trends. We’ve added content marketing, video production, and app development and expanded our digital marketing capabilities to include things such as interactive PDFs and infographics. Plus, it’s making sure that each service delivers on the top-notch quality I never compromise. We don’t fall down on quality. It just has to be right—no question about it! And delivering on that means having the right people on staff as well. At its essence, design is always about solving problems creatively. Having a diverse office means people approach problems in different ways. This makes it possible for us to pull from a wide range of creative ideas when finding the right solution for our clients. Finding that solution requires an ability to listen and see the bigger picture. Since they are so close to the project, clients may not be able to see the best path forward. It’s our job to take the initial idea, complement it with our own, and elevate it to a new level. The solution isn’t just about the design either, but rather how it solves the problem. I think it’s important that we pair the right marketing tactic and solution with our clients’ needs instead of just selling a service for the sake of selling. It’s important to conduct business with integrity. 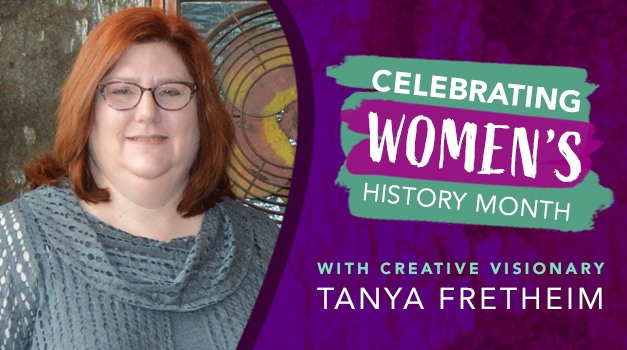 Tanya’s innate knack for getting to the core of clients’ needs, using the right creative resources, and implementing an efficient solution make her leadership more than a woman’s intuition—she makes it her own. She credits her leadership rise to the many women who laid the groundwork and set an example for her. Ruth Bader Ginsburg and Gloria Steinem were some of the first public figures that showed me that strong leadership was possible for women. And as a child of the ’70s, seeing that was a big deal. A bit closer to home, Tanya says her mom, Faith; her great-aunt Ada; and aunts LaVila, Judy, Ruth, and Vi were all role models and provided an example she set out to follow. My mom volunteered a lot of her time while my sister and I were in school, and my great-aunt (a social worker) also worked to help others. Along with my other aunts, they instilled in me a fierce work ethic and desire to give back. Even though some of them aren’t with us anymore, they’re a part of me and a part of who I am as a woman and as a leader. I’d like to think I’ve got the best parts of them and their advice. I carry them with me every day.